During this election cycle just reading the headlines will make you lose your mind. A short week and a half ago, headlines warned: Romney is Running out of Choices and Time, Romney Desperate in Search of Votes, It’s Over—President Obama Will Be Reelected. One debate later the headlines are very different, even opposite: Romney Opens Cracks in Obama’s Firewall, Obama’s Aides Plot Comeback, Obama’s Dilemma—How to Reset the Race. God will not give his glory of authoritatively declaring the future to another. God enjoys displaying his glory in being the only one who knows for sure what happens next. That is why the story of presidential elections (and everything else for that matter) is the story of surprises. There are surprises in every presidential election in the last century. Sometimes those surprises are huge in magnitude (President Truman’s defeat of Thomas Dewey in 1948). Sometimes those surprises are of a smaller sort (Al Gore lost his home state of Tennessee to George W. Bush in 2000). The same will hold true this year. There is a vice-presidential debate tonight, and then two more presidential debates in the weeks to follow. The election narrative will reset after each of those events. Then, when we wake up on November 7th, all of us will be puzzling over different things. That means Christians should not waste their time playing the pagan game of guessing the future when it comes to elections. Instead of guessing Christians should be using their time doing three much more important things: praying, pondering, and persuading. First, we have a command that we are to pray for “Kings and all who are in high positions” (1 Tim 2:2). 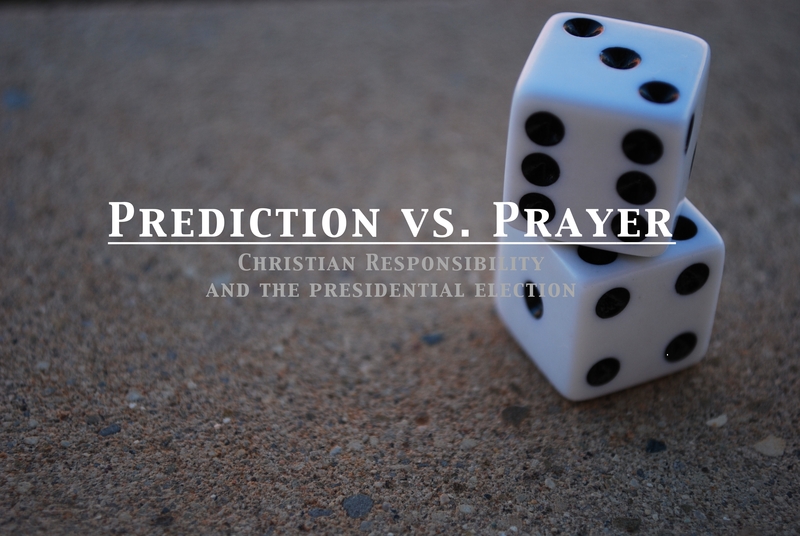 That means we should be praying for Mitt Romney and Barack Obama. One of them will be our president for the next four years and they need grace to be wise, strong, and full of integrity. Instead of guessing about the election we should be praying for it. Second, we need to ponder the many different issues at stake in this election. There is no shortage of crucial issues to consider—abortion, tax policy, religious liberty, international affairs, and many others. Some Christians think we shouldn’t vote because Romney is a Mormon or because the candidates are not that different. Many Believers think that Romney should be elected because he is the best to defend the moral issues Christians care about. Some argue Obama would be a better defender on social justice issues. The point is that all these things are worth pondering. Thinking about such matters (and praying for them) is infinitely more profitable then chewing your nails trying to figure out what will happen on election day. Finally, after we have prayed about the issues, and pondered them, we need to try and persuade others. As Christians we should use our conversations, tweets, blogs, and news stories to contend for the candidate we believe is the most suitable to hold an office as significant as president of the United States. For my money, Christians will make an egregious error if they abstain from voting or vote for any candidate who is openly in favor of killing innocent human beings. I’m sure there are some who are offended by that or who disagree with me. That’s fine. Let’s talk about it. That is a conversation that will matter. Heath Lambert is the Executive Director Elect of the National Association of Nouthetic Counselors and the assistant Professor of Biblical Counseling at Boyce College; He is also the author of Biblical Counseling After Adams and co-author of Counseling the Hard Cases.